In an office situation, depending upon the location and the kind of products that you keep in your office, there are different levels of security that you might want to consider, especially when you have a situation where you are in need of keeping your office doors locked through the duration of the day. In this case, it can become a hassle to have employees going to the door so often because it can be disruptive to the workday. So in this case, many employers might ask, what can I do to secure my workplace, but also limit interruptions to promote productivity? There are a few answers to this question, and it will all depend on how secure and how complex you want your system to be. In terms of building codes, this is likely going to mean something that will lock only from the outside, making it easy for people to leave in case of emergency. Depending on the kind of locks the doors in your office building have and if they are capable of locking from only one side, this may require you to change some of the locks. Additionally, you will have to make sure that you have doors that close on their own so that the doors can lock again after each person walks through them. When considering the intensity of your system, you will have to consider a few things, primarily the level of security that you desire. The first option is to have a door that is always locked with a doorbell. This situation, however, would be one in which someone has to go let whomever is at the door in. The next option would be to always have your door locked, and use an intercom to screen those asking for permission to enter your building. In this case, you would still need to get up and physically let someone in. An intercom with an additional door release would be the next step. 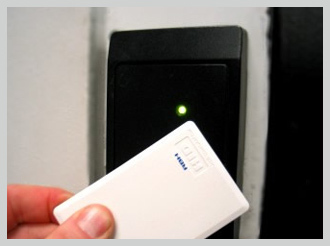 In this case, you can communicate with the person who wants to come in, and let them in remotely. After that, the next upgrade is to have a video intercom with a door release. This will also allow you to see people that are requesting access. The final and highest level of security, and also the most complex, is a standalone camera with an intercom that has a video recorder, as well as a door release. These are the levels of systems that one could use to maintain security in an office space. In any situation, you need to consider all of the components that can come with a buzzer system. You need to make sure you have the proper hardware in terms on entry ways and locks, you have to consider to what degree you want to monitor or record who is coming into your building, and you need to make sure that whatever you do, you are in compliance with all building and fire codes. What should you look for in a video surveillance system?